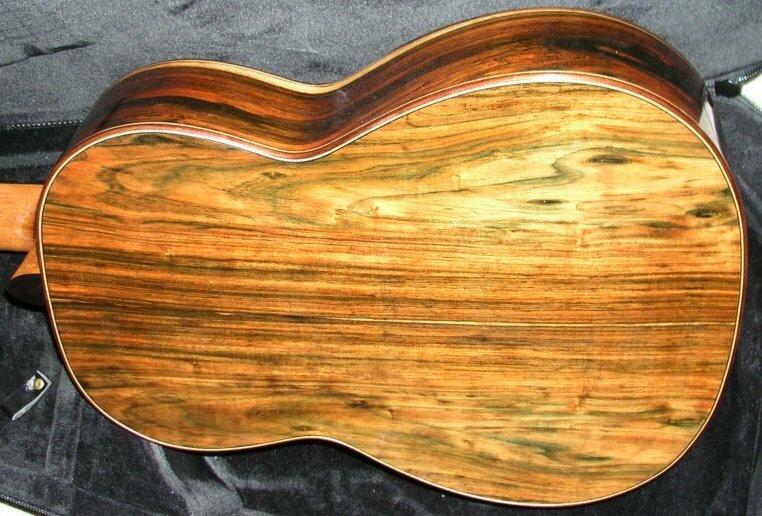 Braceless Back & Sides: Choice of Kingwood,Brazilian Rosewood, Cocobolo, Macassar Ebony, and Maple. 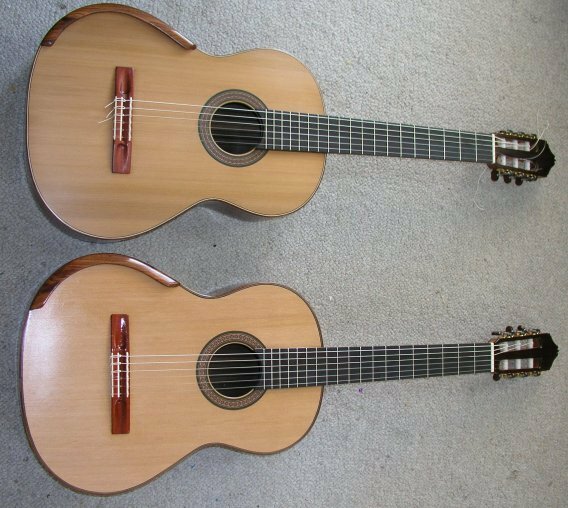 Tuning Machines: Choice of Gilbert or Sloane. Upgrades to Rodgers, Reischl, or Alessi at an additional charge. Options: Neck with adjustable action. 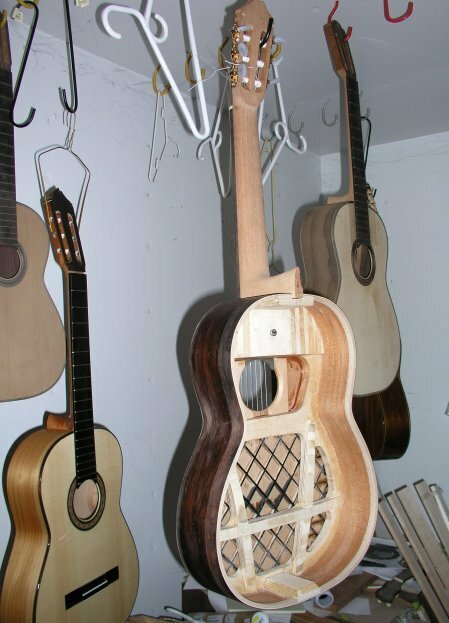 Sound Sample(1.2mb) of 9x9 balsa lattice bracing with Carbon Fiber.Adj.Neck model. The adjustable neck option allows the action to be adjusted without having to replace the saddle or make adjustments to it. 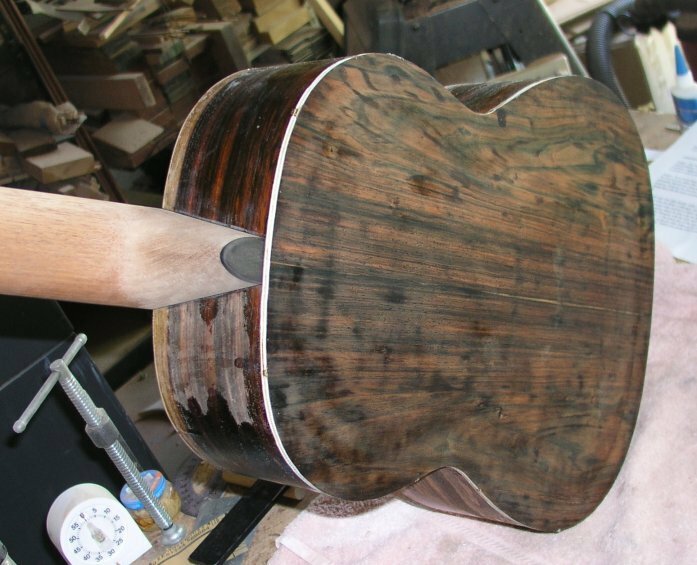 Raising and lowering the saddle can cause a change in the timber of the guitar. 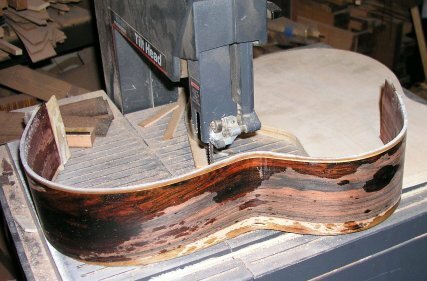 The adjustable neck solves this issue and allows the player to experiment and fine tune the action to their desire without having to take the guitar to a luthier. About the photos on this page: What you see on this page is the evolution of my research and design inspired by the work of Greg Smallman. 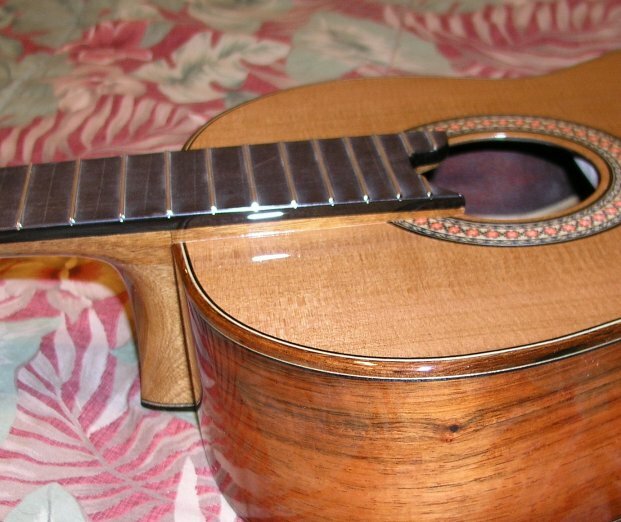 The photo at the top of this page is the first Schramm lattice style guitar. 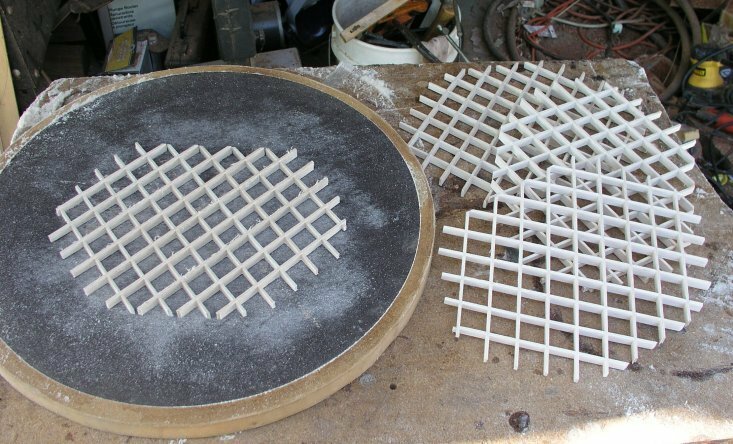 As you scroll down the page you will see how my lattice instruments have evolved. 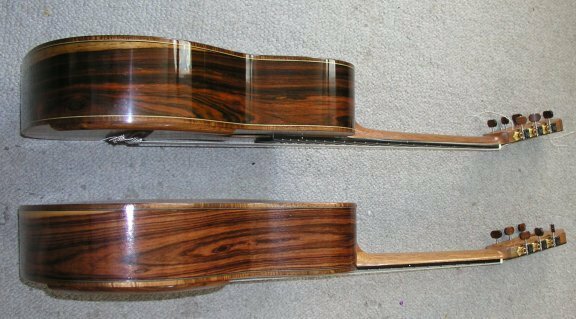 While my guitars are similar to those of Greg Smallman, they are not copies. Just as Hauser and Romanillos were inspired by Torres but not copies. 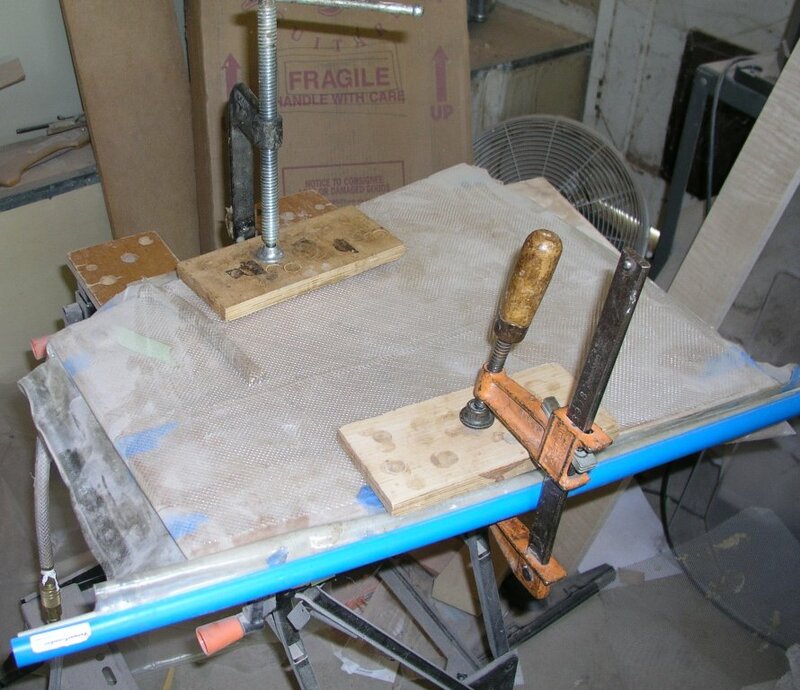 Current R & D projects include work on a milled carbon fiber/epoxy fingerboard as well as Diamondwood fingerboards. Sound comparison of a 2001 Greg Smallman and a 2006 David Schramm lattice guitar. "Fandanguillo" by Torroba. 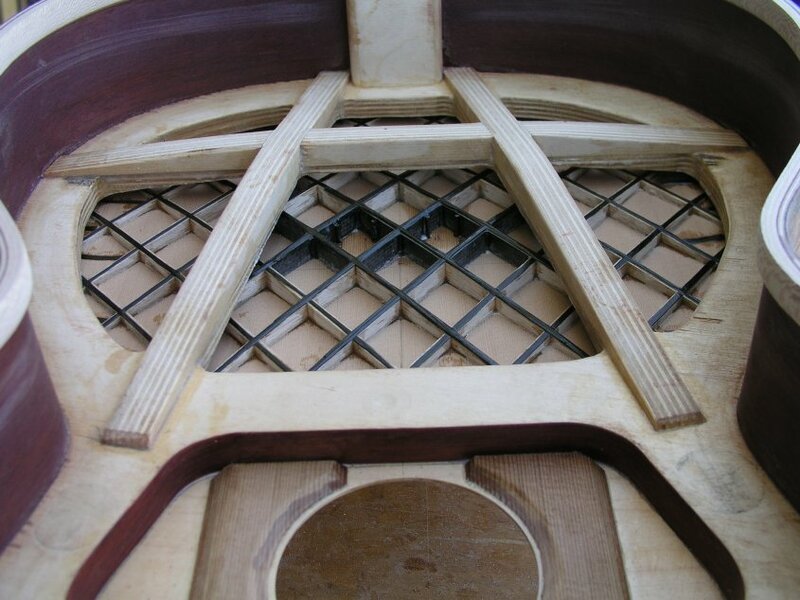 Balsa lattice bracing being shaped to the dome shape of the top. Inside view of adjustable neck model. 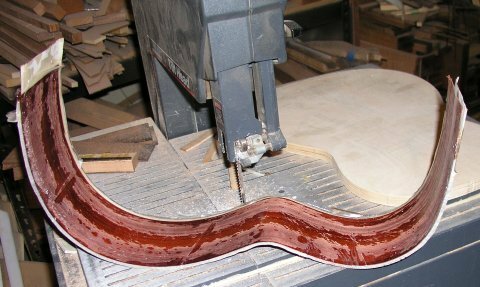 Interior veneer is Australian Jarra. Adjustable neck features an allen bolt between the 17th and 18th frets. There is no degradation of sound quality with this style of neck. 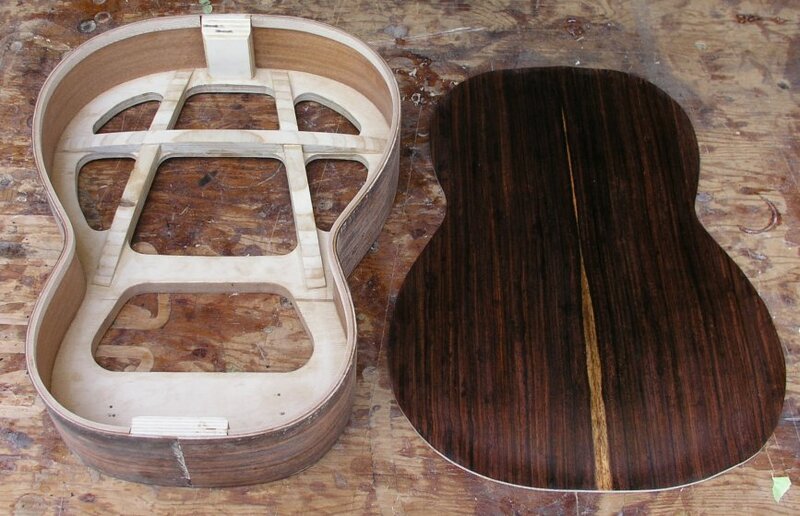 The "guts" of the adjustable neck. It is held on by the pull of the strings. 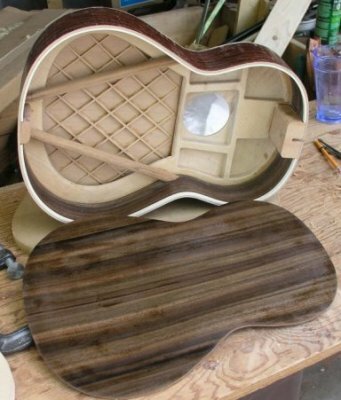 There is a small mortise and tenon joint that acts as a vertical stop and the neck pivots off a horizontal piece of carbon fiber. 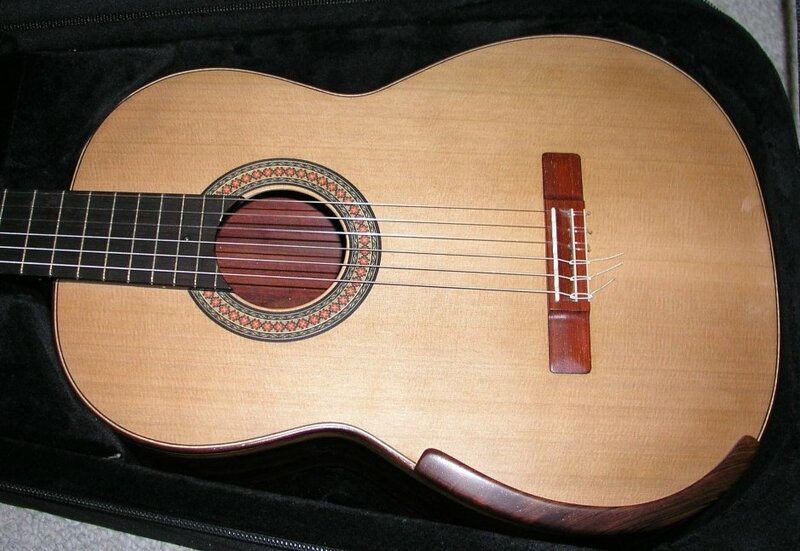 The set screw in the neck/fretboard adjusts the action. 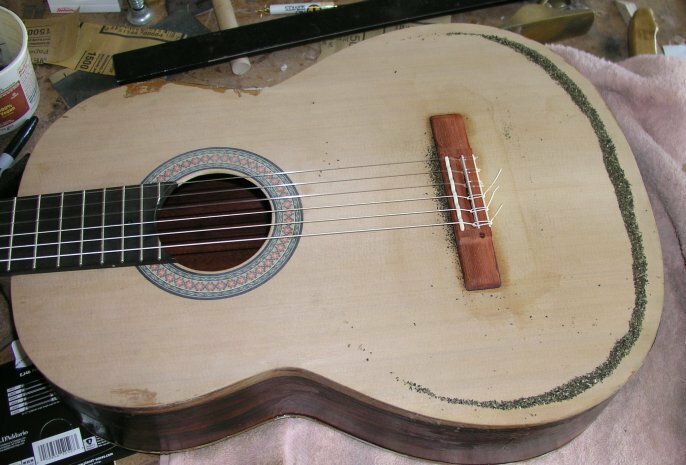 The guitar is strung up prior to binding and purfling the edges of the guitar so I can make final adjustments to the resonance of the top. This photo is of the monopole vibration mode. 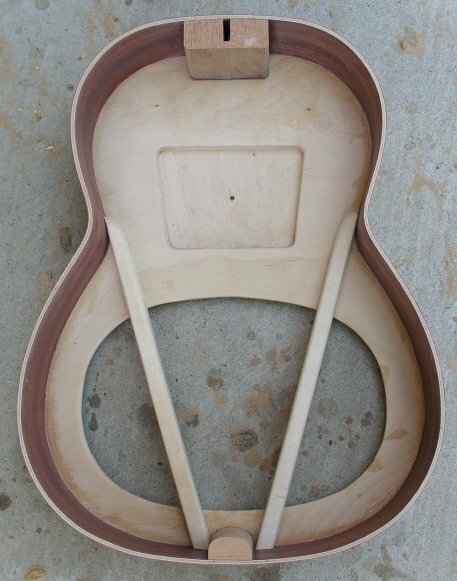 Here is a Sound Sample(1mb) of the adjustable neck model prior to having the finish applied. The adjustable neck model features a different shape to the heel that helps prevent any side play in the neck. 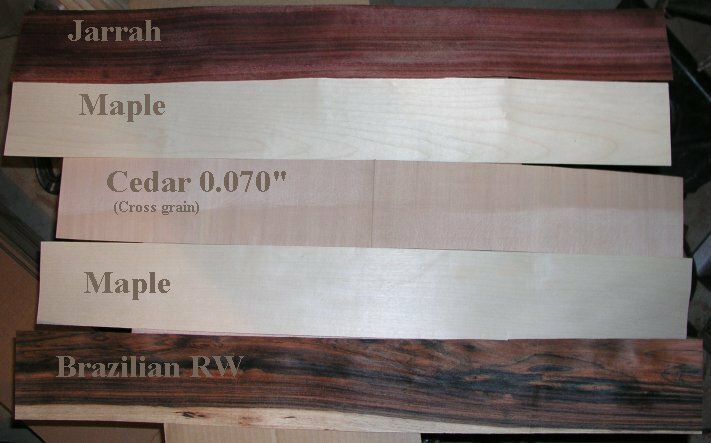 Here is the typical veneer sequence for laminating the sides. Fresh out of the mold. inside view of the sides. Fresh out of the mold. Outside view of the sides. 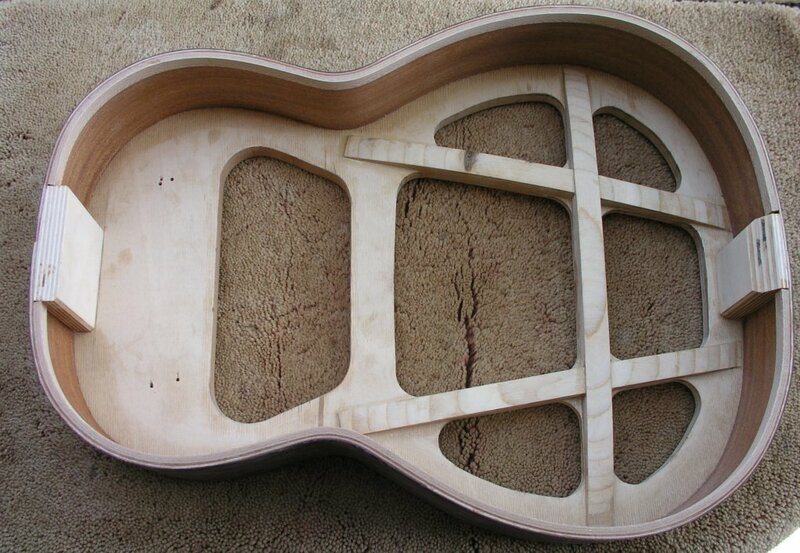 Inside the body prior to attaching the top. The upper bout is solid. Only the lower bout is active. 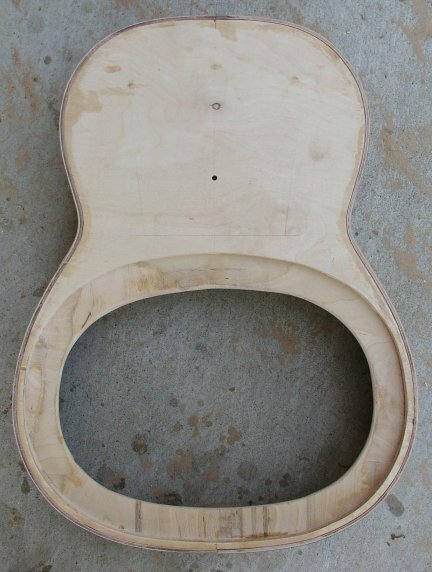 This is not a problem because the upper bout adds nothing significant to the sound of a guitar. The adjustable neck is reinforced with carbon fiber bars and hard maple. 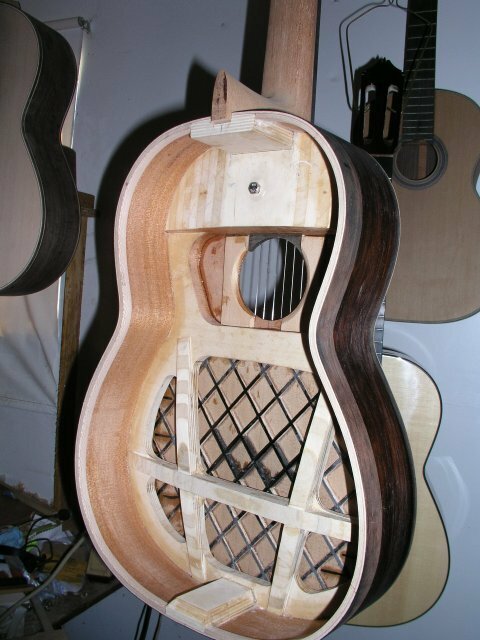 The first two Schramm lattice guitars! 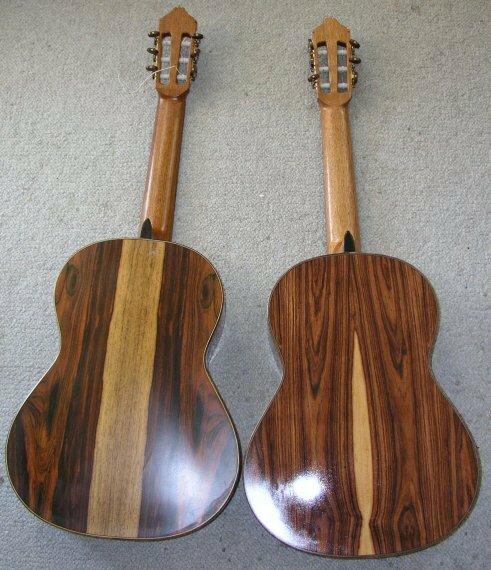 Notice the arm rest on these guitars. The arm rest prevents the player from touching the top allowing more of it to vibrate. Back of adjustable neck model. 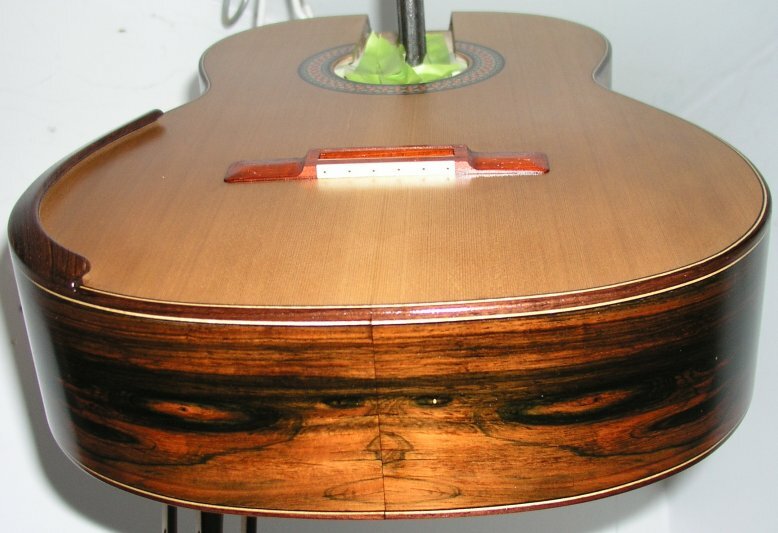 Top of adjustable neck model. 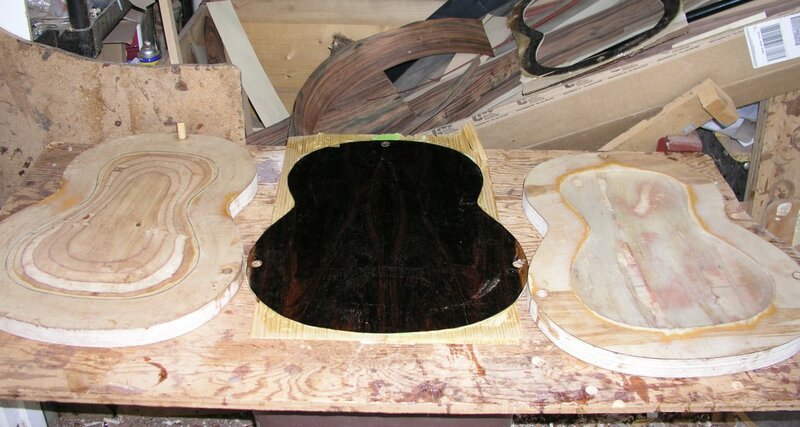 Adjustable neck style body prior to attaching the back. Summer 2008 chassis design with deeper molded back. 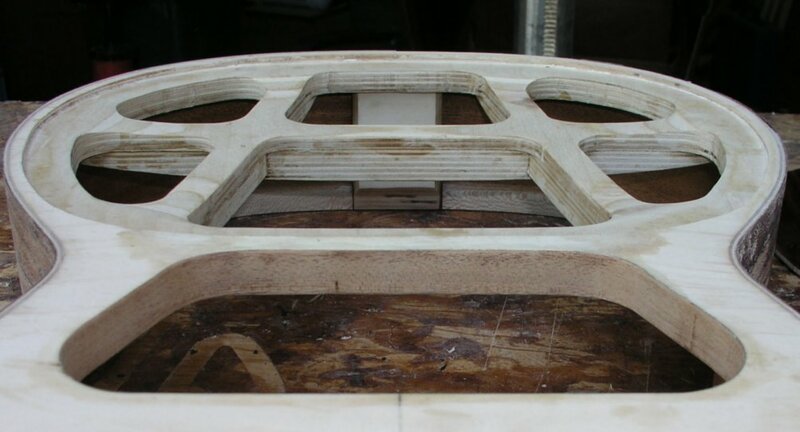 Top view of the Summer 2008 chassis. Scooping of the "A" bracing. Inside view of the Summer 2008 chassis. 2008 design with extra heavy density balsa bracing and carbon fiber. 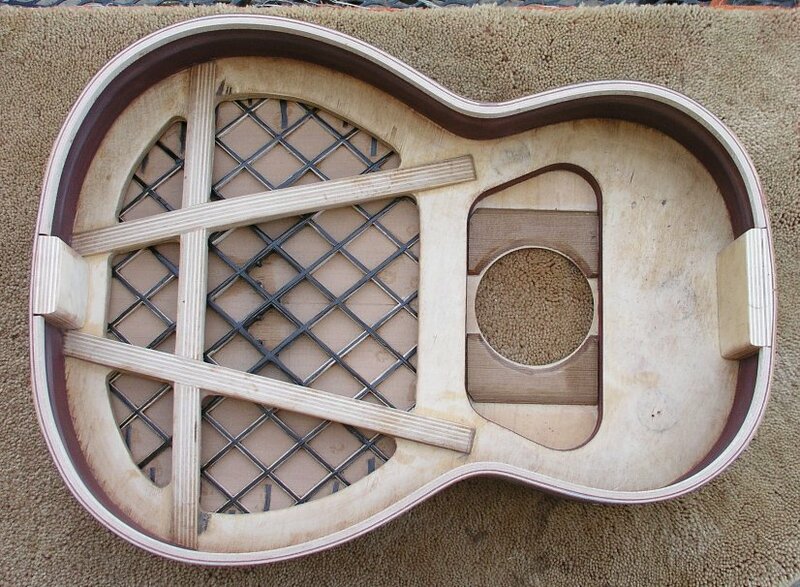 630mm short scale lattice guitar. 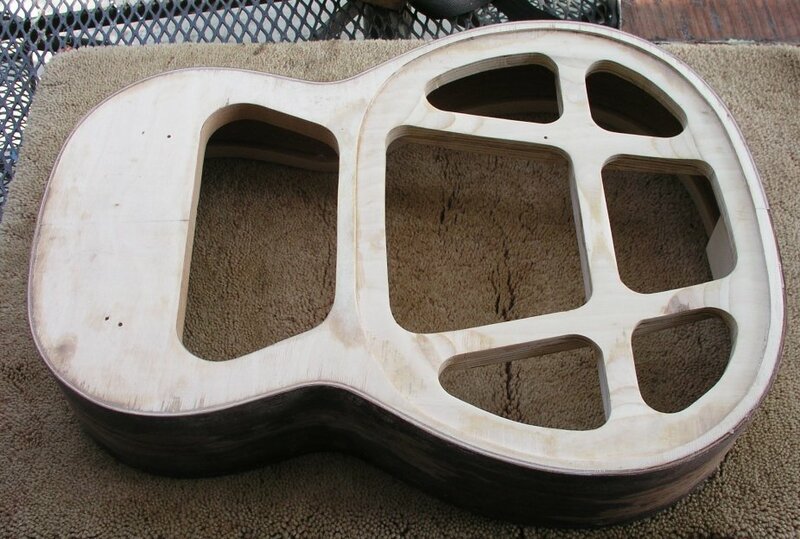 2008 elevated fingerboard model lattice guitar. 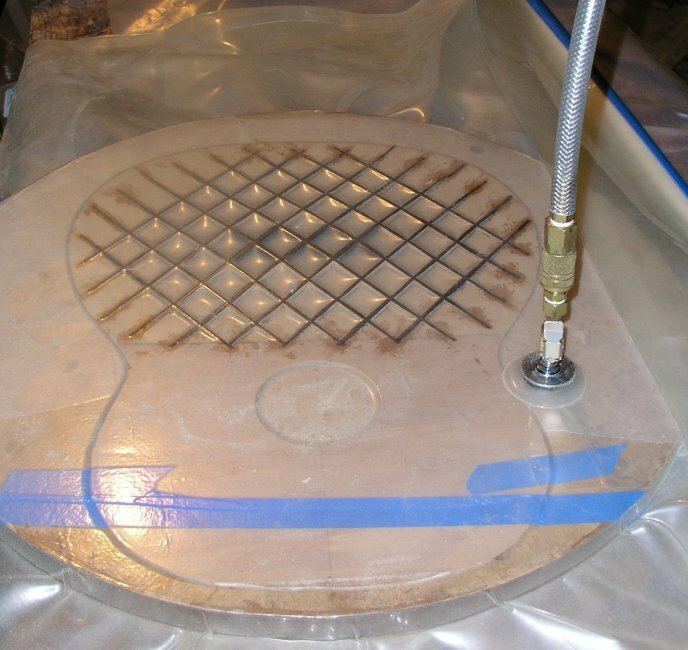 Back being molded in the vacuum press. 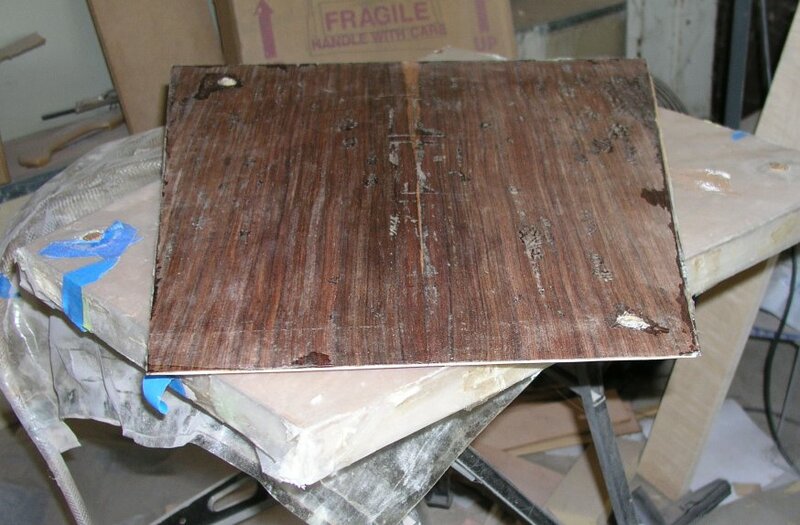 Back removed from vacuum press. Inside view of back. 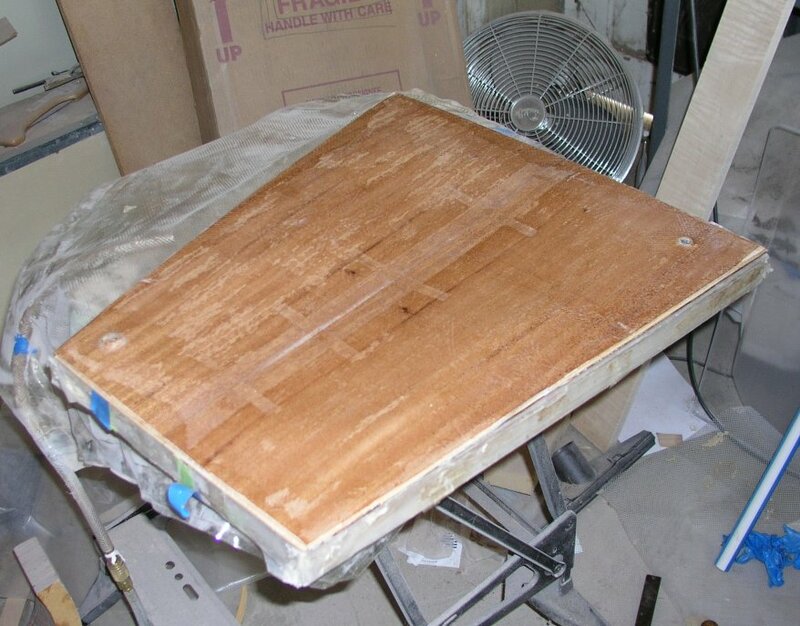 Back removed from vacuum press. Outside view of back. Arching of the back. No braces are needed for these backs. 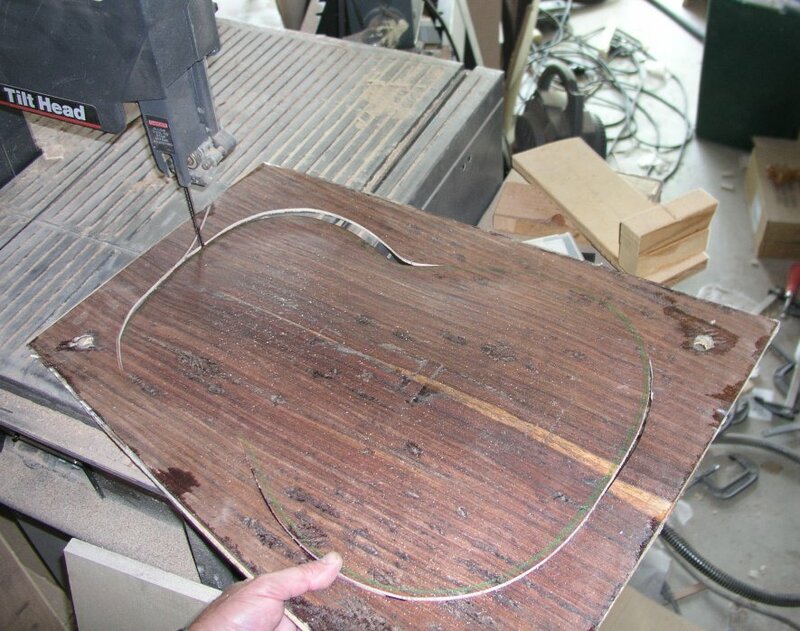 A 2009 Schramm lattice guitar with the lattice being glued to a soundboard via vacuum clamp. 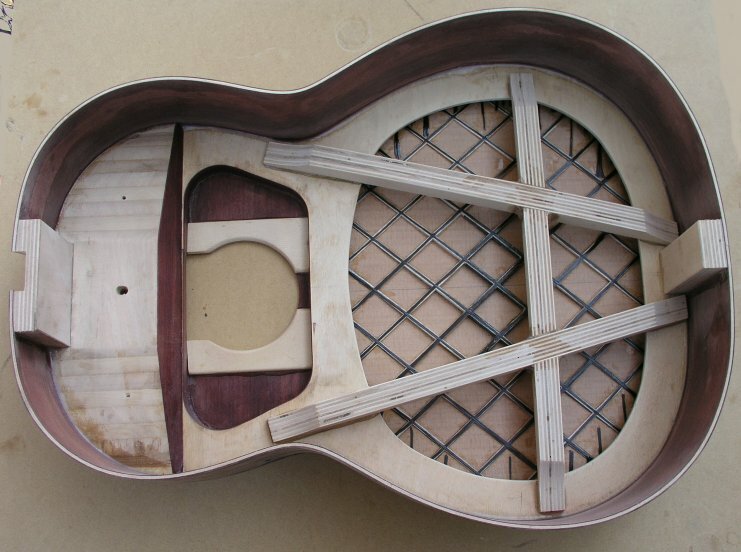 Built in August 2008, this lattice guitar has an adjustable neck system similar to the design of Greg Smallman. 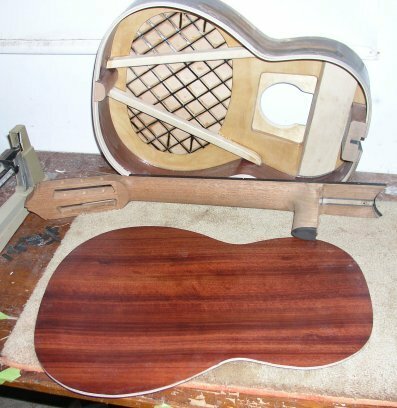 At this stage I "voice" the instrument with the back off! 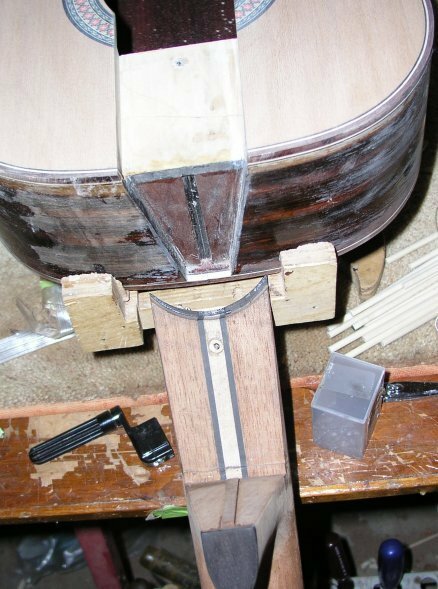 I remove wood at specific locations to adjust the timber and feel of the instrument. Believe it of not guitars sound just as loud without the back. 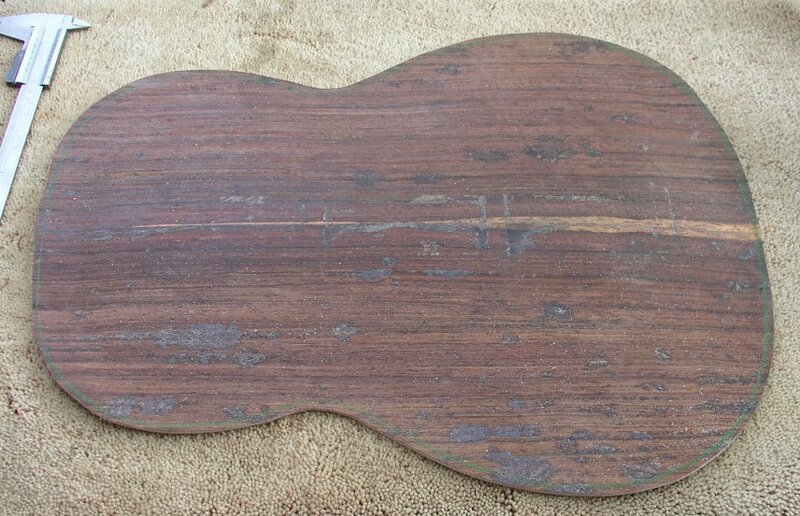 Here is a Sound Sample of this guitar without the back prior to any adjustments. 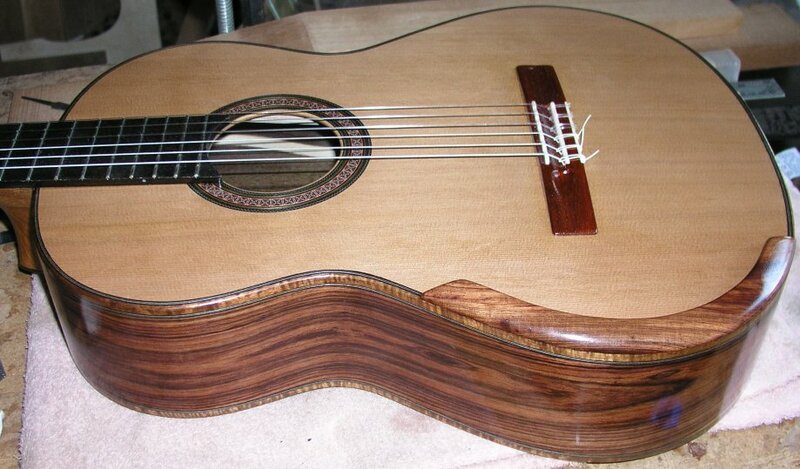 Here is a Sound Sample of the same guitar after adjustments. 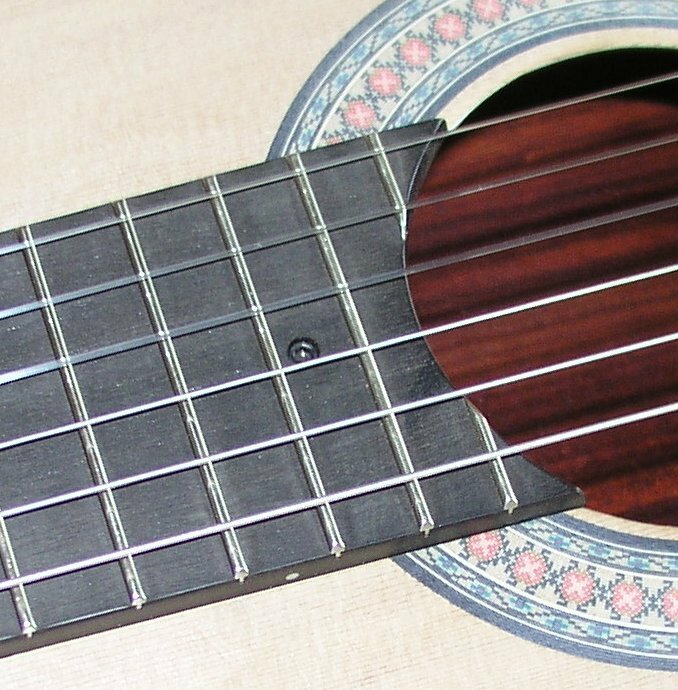 Close up of the same 2008 guitar.